Tu B’shvat or Tu Bishvat is a Jewish Holiday that starts on the sunset of January 24th and continues until nightfall of January 25th. It is a special day for celebrating trees, kind of like a Jewish Arbor Day as well as ecological awareness in general. Since we love trees and crafts we decided to brighten up a dreary winter day with some pretty tree sun-catchers. Click through for step-by-step instructions for this fun craft! First, create your sun catcher canvas by tearing out a rectangle of wax paper and laying it out in front of you. Fold it in half. 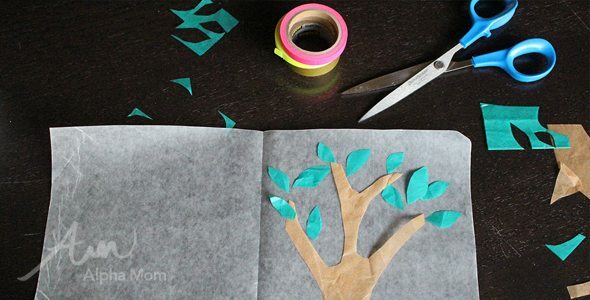 Next, cut out your tree trunk and/or branches shapes out of brown tissue. Lay them down on the right side of the wax paper. Then cut your leaves and place them where you would like. If you’re having trouble getting your flighty tissue leaves to stay put, use a wet cotton swab stick to lightly dampen the tissue and make it stay still. Tissue will stick to each other when wet but not to the wax paper. This can help if you have little hands that get impatient when things move around. Once everything is in place how you would like it, fold the left side of your wax paper back over like a book. Make sure everything is smooth and still in place. Then place your folded wax paper art onto a clean dish towel. Fold the dishtowel so that it sits between two layers of fabric like a sandwich. Now for the tricky part:. Turn your iron* on to a low setting (without steam). My kids are just the right age to start using an iron but if you think it might be dangerous and they don’t quite understand how to use a hot tool please please have a responsible adult do this part. (Always err on the side of safety.) When your iron is hot, press it down onto the dish towel (with wax paper inside) and hold for 10 seconds. Repeat until you have covered your entire wax paper. Then open your dishtowel and admire your beautiful wax paper art! (Warning: Be careful it might be hot! Let it cool for a few seconds before handling.) Don’t worry if it looks a bit rippled, that’s just the nature of this craft. Think of it as texture. You can now trim your wax paper into any shape you would like and use the washi tape on both sides to create a frame. Hang in the window with more washi tape and admire all the pretty colors as the light shines through! No matter what the weather, we can always appreciate nature brightening up our day! *Irons are hot. Always be careful!